with the main casts: Shu Qi, Karen Mok and Zhao Wei. Indeed a great movie to watch! Here's the plot of the movie I got from Wikipedia. 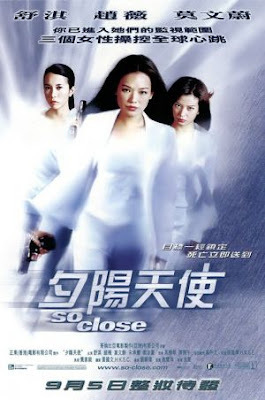 Ai Lin (Shu Qi) and her sister Ai Quan (Zhao Wei) are computer hackers and espionage specialists who use their late father's advanced secret satellite technology to give them the field advantage over their enemies and the local law enforcement. At the start of the movie they assassinate the chairman of a top Chinese company. In the aftermath of their successful mission, an intelligent Police Detective named Kong Yat Hung (Karen Mok) is assigned to their case and is able to track them down. The cat-and-mouse chase becomes more complicated when Lin and Ai Quan become the targets of the very people who originally hired them. As Ai Quan was always the assistant on their computer at home while Ai Lin, the older and better assassin, did the field work; this was met with jealousy from Ai Quan, who wanted to do field work. Ai Quan, not knowing that Ai Lin was merely trying to protect her, believed that Ai Lin forbade her to fight and kill because she was the less adept of the two. When Ai Lin fell in love and decided to give up her life as a contract killer to marry and live a "normal" life, argument rose between the sisters - Ai Quan wanted to continue contract killing to someday prove that she could become a killer as good as her older sister. On the day of Yat Hung and Ai Lin's birthdays (coincidentally, the same day), Ai Quan is found by Yat Hung at a bakery buying cake, which leads to a frantic car chase. Ai Quan becomes cornered by police cars and seeks help from her older sister Ai Lin, who is at home. However, at the same time, killers hired by the man who originally hired the sisters make advances on the sisters' house and Ai Lin is killed while trying to save her younger sister Ai Quan. Yat Hung is framed for Lin's death. Left with no choice, Yat Hung teams up with Ai Quan to find Lin's true killer. thanks for joining us this week mommy phebie! next week, it's sandra bullock movie time! happy tcp! I liked So Close too. I became a fan of the 3 actresses after watching it. Plus, I love the added conflict that Karen Mok's Character brought into the film. i love this movie mami phebz, parang women empowerment ang dating, galing nila.